The Pentax 18-135mm ƒ/3.5-5.6 ED AL [IF] DC WR has been on store shelves since November 2010, sold as a kit lens with the K-5 and K-5 II bodies, but also available separately. The lens takes 62mm filters, ships with a petal-shaped hood, and is available now for around $530. You could say this lens has a bit of a personality: Sharp results across the frame are possible when the lens is stopped down, but on average you will see some soft corners. The wider angles show the worst corner performance: when used wide open at 18mm it produces some pretty soft corners, worse at 24mm. However, this is matched with some fairly decent central performance, all the way through to 50mm. As the lens is stopped down the corners improve slightly, but never become tack-sharp; the best results are obtained at 35mm and ƒ/8, where it's almost tack-sharp. At 100mm and above, this central region of sharpness begins to retreat, and you're stuck with soft corners regardless of the aperture. Diffraction limiting sets in at ƒ/11; fully stopped-down performance is best avoided, as the resulting images are mediocre at the wide angle (at ƒ/22) and distinctly blurry at the long end (at ƒ/40). Below 100mm, chromatic aberration is tolerable - just some light color fringing in areas of contrast, and only in the extreme corners. As the lens is zoomed in to 100mm and 135mm however, chromatic aberration is quite prominent, in fact, some of the most noteworthy we've come to see in these tests. Central performance is still good, but don't expect great detail in the corners. Most zoom lenses tend to produce images with darker corners, at least when used at their widest aperture settings, and when zoomed to the wide-angle. The Pentax 18-135mm ƒ/3.5-5.6 WR is no exception, where using the lens at 18mm and ƒ/3.5 produces corners that are 3/4 of a stop darker than the center. Any other setting produces results with corners that aren't as dark, and when set to an aperture of ƒ/8 or smaller, dark corners aren't a factor. Curiously, when set to the 35mm focal length, there is no corner shading, even when used wide open. Results for distortion testing were typical for this type of lens: strong barrel distortion at the wider angles (less than 25mm), approaching +0.1% barrel distortion in the corners. There is no distortion-free focal length; you will always have some level of barrel or pincushion distortion in images produced by this lens, but happily, the numbers aren't overly high. Above 25mm, distortion quickly devolves into a mix of pincushion distortion in the corners, and barrel distortion throughout the rest of the image. This level of distortion reaches its most objectionable state by the 50mm mark, where we note -0.6% pincushion distortion in the corners, but just +0.1% barrel distortion on average through the rest of the image. Pentax adopts a new focusing motor with the 18-135mm ƒ/3.5-5.6, called the DC ("Direct Current") motor. It purports to be less noisy than previous motors: it produces a light whirring when in use. Autofocus speed is pretty good, taking about one second to go from to close focus to infinity. The lens employs a "quick shift" autofocus system, meaning you can override autofocus results at any time by just turning the focus ring. The lens uses an internal focusing system, which means the front element doesn't turn, and makes life that much easier for polarizing filter users. The lens offers 0.24x macro magnification, with a minimum close-focusing distance of 40 cm (about sixteen inches). The Pentax 18-135mm ƒ/3.5-5.6 is small but substantial lens, weighing in at just under a pound (14.3 oz, 403 grams) and balancing nicely on our K-5 test body. Pentax's DA lens aren't usually outfitted with weather sealing, but Pentax has made the exception with this lens and introduced another suffix to the lens' designation: WR represents six layers of weather sealing within the lens, making it water resistant. Despite being a consumer lens it does sport some quality touches, such as using seven rounded blades to make up the aperture and theoretically provide some pleasing out-of-focus background areas. The lens uses a fair amount of plastic construction to keep the weight down, but key areas such as the lens mount are metal. 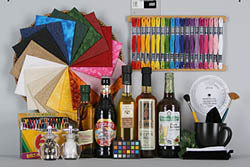 The optical formula is quite complicated, 13 elements in 11 groups, including 1 ED ands 2 aspherical elements. The lens has no control surfaces other than the zoom and focus rings. On the Pentax K-5, auto / manual focus operation is controlled by the camera, and autofocus results can be overridden via the quick-shift system. 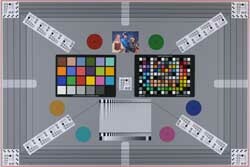 The lens has no scales at all - distance, depth-of-field or otherwise. The zoom ring gets all the attention with this lens. At 1 3/4 inches wide, there's plenty to grab, and the rubber ring uses a series of deep ribs for texture. The resistance on the ring is just right, turning smoothly through its range of 90 degrees. The lens extends as it is zoomed out, adding a further two inches to its length at 135mm. Our technician Rob noticed some interesting behavior regarding the lens as it was zoomed in and out. When this lens is mounted on the camera and you zoom it, you can feel the air escaping from the rubber cover that covers the HDMI port on the camera. With the port securely closed, the zoom ring is harder to move. With it open at all, it zooms very easily. It may creep in if you leave that rubber port open, but may not if the port is closed. The focusing ring leaves a lot to be desired, if you have any need to focus manually. The ring is just a quarter-inch wide, with very small ribs. The autofocus system uses soft stops to indicate that you've reached the threshold of focus on either side. The PH-RBM petal-shaped lens hood is the standard Pentax affair - reverses and mounts for easy storage and does well to reduce lens flare. Pentax makes it easy for polarizer use by providing a removable window in the lens hood, so you can turn the polarizer from outside the hood. The interior of the hood is a smooth matte black finish. It may not provide the same telephoto reach of the 18-135mm, but it is a much sharper lens, complete with a consistent ƒ/4 aperture across its focal range. It also has its issues with chromatic aberration. 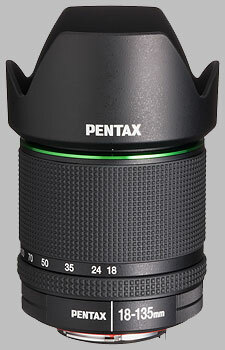 Slated to be released in November 2012, the 18-270mm will be Pentax's answer to the Tamron 18-270mm. We haven't yet tested the Sigma 18-125mm, but it is available in the Pentax mount; as Pentax camera bodies include in-body image stabilization, you would want to ensure that the OS stabilization in the Sigma lens is turned off. As economical consumer lenses go, the 18-135mm ƒ/3.5-5.6 WR performs fairly well: it has some problems in the corners of the images it produces, namely, they're soft in the corners at certain apertures, and have high chromatic aberration as well. I can't help thinking that a directive came down that the Pentax kit lens needed to have more reach, and cost less, so to get there, some corners had to get cut. For the majority of users who will buy this lens - as the companion lens to a K-5 II purchase - it will no doubt meet their needs. But for the discriminating user who demands the sharpest and the cleanest of images, be prepared to buy up to the DA* line of lenses. I have a number of zooms, including original Sigma 17-70 and Pentax 18-55. This lens beats them in most ways (including overall sharpness). The real strengths are the relatively compact size (versus flexibility and performance), excellent auto focus and Weather Resistance. I'm not worried about taking this lens anywhere. Yes the lens does suffer with soft corners at the long focal lengths but IMO the lens is still very usable and i have had some good usable results at 135mm (which I would have missed out on with the 17-70). I did some detail tripod test shots (uniform fences etc) against my Sigma 17-70 and this lens stacks up very well. Often sharper at same focal lengths and aperture settings (even frame edges over most of the range). I don't really agree with Klaus's final conclusions on Photozone (see: http://www.photozone.de/pentax/597-pentax_18135_3556), although you can't fault his technical measurements and methods which I have a great deal of respect for. If you compare the results for this lens to other offers like Nikons http://www.photozone.de/nikon--nikkor-aps-c-lens-tests/634-nikkor181053556vr , I think the Pentax actually stacks up pretty well. Its much more compact, has WR, better build and generally better centre sharpness. I got this lens for the WR and I'm much more impressed than I thought I would be. I had visions of this lens being my day to day lens and saving the 50-135 for important shoots. Gotto say the images were never 'great', always ok but never great. After about 2 months I put my previous day to dya lens on for one special occasion (18-250) - and wow the photos of my kids at a school formal event were immediately noticeably better. When money got tight one lens had to go and a little reluctantly the 18-135 was sold. Maybe I had a bad copy, or maybe the 18-250 is a better than average copy but optically there was not comparison. My 18-250 is not far behind the great 50-135 in many conditions. DC motor is fantastic. Quiet, fast - my dreams come true. I've bought this lens because of excellent zoom range and WR - like a kit replacement. I've thought that photozone guys got bad lens but seems that I've got the same. Sorry guys but I don't know how can you say "sharp" about this lens. Kit lens 17-55 II is much more sharper than this one. This lens was part of the kit with the K-5 an it's a quit nice upper quality kit lens. I really like the fast and silent built in AF-Motor which until now never misfocused. Also sharpness is quiet good from f5.6 until f11 - best on f8. CA is nearly not recognizable, just a little blue CA if zooming in 32x. What I don't like is the easy to see distortion on wide end until 25mm. On tele end you should not use filters if you don't want falloff in the corners. A slim filter is unfortunately no solution. MF is no problem to use, but the ring could be bigger. Grip is always nice. By the way the lens looks nice, is weather proof, has inner AF nad the lens cap has an optional cutaway for using filters. price(I paid about 300US for it since I bought it as a part of K5 kit),AF and good flare resistance. cornersharpness at long end and distortion at wide end a bit too much. first , it was so cheap in Japan when I was there so I could not resist and ordered it as a part of my K5 kit. for the price I paid for it it is an amazingly well blanced lens , quite sharp and it almost never flares in any light. CA at wide end light fall off are a bit serious but to be honest more expensive Nikon AFs16-85Vr has more pronnounced CA and more serious amount of light fall off. And the Nikon distorts more much more actually at 18mm than this Pentax. The Nikon also flares more easily. Compared to also more expensive Canon EFS15-85IS, which I use for my 7D, the Canon is sharper all range and aperture combination but the Canon is a much bigger and more expensive lens , so it is not in a same class I guess and neither Canon nor Nikon are sealed like this one. also , this Pentax DA18-135 is so so so compact and optically not bad , not great for sure but who expects it to be great in this price range? this lens is a really much less distorted lens than any other similar super zooms from many other makers. I think this lens is really good for its modest price. it is so small , so light so practical , it AF fast , on my K5 , it focuses very very fast in day light and fast in low light and almost never hunt like old Pentax zoom on K7 or K20D. I originally bought this lens for upcoming Thai new year's water festival and I am sure it will work there fine. After this lens + K5 experience my view on Pentax system changed quite much , I am now thinking about selling my D700 system and get more Pentax lenses to go with my Canon 5D2 system. For me the weight of Nikon kit is not any issue since I work out but the size of it is very very seriously annoying , it takes some nice smiles of local people here and it always difficult to travel with it. So, for my needs,the 5d2 and this K5 are better suited and much more manageable travelling SE Asia and East Asia , sometimes in Africa. Oh as for the AF it is not even half as bad as many Nikon fanboys make it out to be , so no worry about its AF , the K5 is not like other Pentax cameras befoere it , it AF reliably well in both day light and low light even in AFC mode. Just not expect the speed of the 7D or the D700 but it is fast , not any slower than the lower quality D7000.